This creative team is really knocking it out of the park! I got the Coipel cover and added the Conner variant to my wishlist. I have been a fan of Coipel’s since House of M, which was pretty awesome. Like most people, Laura Martin popped for me during Whedon/Cassaday’s Astonishing X-Men run. Wood has one more issue to give us a Coipel drawn Lockheed, which hopefully is coming. Wood is going to go the route of Whedon/Bendis/Aaron and only give their artist the “only every other three issues” rule of letting Lockheed appear. Coipel is definitely rocking a new style in these issues than I am use too. I really like it, not sure how to describe it. I want to say it is a more mature style but that isn’t quite it. Wood gives us one of the first interactions between Kitty and Rachel in a while. They have been in the same panel panelbefore but they don’t really ever talk to each other. The Colorists make a decision to make the comic look darker on certain pages that really compliment the art. Such as the page where Rachel and Psylocke are interviewing Sublime. Kitty fights Arkea controlled Omega Sentinel. Love how Kitty’s powers and skillset is used here. 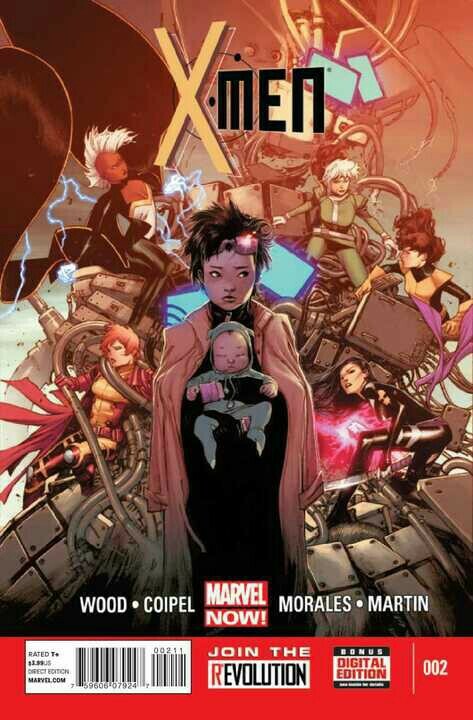 I also like how adding a baby is an easy way to age Jubilee and add a new generation of mutants as we all know that these characters can’t age so we have to give them babies in a different way. I also like how this isn’t a six part story, as it feels like we are really moving and the stakes are high. I have no real connection to Omega Sentinel, outside of Carey’s great run on X-Men Volume One and the Facebook game: Marvel Avengers Alliance, in which she is quite impressive. Hopefully no one dies from the bomb. My goal with this blog is to discuss, who I believe is the greatest fictional character of all time, Kitty Pryde, the X-Men’s Shadowcat. Her along with her purple dragon-shaped alien companion, Lockheed, and her best friend, Illyana Rasputin, Magik. Now I know some people out there are muttering to themselves how Rachel Grey is Kitty’s best friend, or at least, one of them. I agree Rachel is one of her best friends, but I have always liked Illyana over Rachel. What a great way to segue into who I am. I started my comic book reading habit as a Spider-Man fan with issue 371 of Amazing Spider-Man. I was a fan of Spider-Man right up til One More Day. I mean, would you make a deal with the DEVIL and sacfrice your happy successful marriage in order to give your dying eldery aunt like ten more years? I know I wouldn’t, thus I dropped those titles. My love for the X-Men starts where most children of the 90s comes from, the FOX animated series. It is my belief that Kitty and Lockheed were not part of this show at all, because they were being punished for the wonderful pilot from the 80s, Pryde of the X-Men. Which, surprisingly, was not a success. My first exposure to Kitty was most likely with Spider-Man issue 25, which guest starred, Excalibur, the British X-Men. My goal with this blog is to review my collection of comics. I have an unofficial agreement with Marvel Comics, where if they put Kitty in a comic, I would buy that comic. I also collect every appearance that Lockheed and Magik has made. Which there was a point in time in the 90s where this was not an expensive exercise as Illyana was dead and Kitty was not being used on a regular basis. I also collect every homage cover to Uncanny X-Men issue 141. According to my wishlist over at comicbookdb, a great website that I check regularly, if not daily, I am only missing 234 comics, including variant covers. Which out of my 1,834 collection, I think this pretty decent. I will most likely review other items as well, such as statues, cartoons, films, news, and anything else that might come up. I am a huge fan of Uncanny X-Cast, Uncannyxmen.net, Newsarama, and Comics Should be Good. Back in the day, I was a huge fan of Dave Campbell’s comic blog as well as Chris Simms’ blog. I will review older titles as well as the newly released titles. Then from time to time, A+X, Scarlet Spider, and various other guest spots. I pretty much rely on the good folks over at the X-books forums on Wednesdays to review the new releases so I know which comics to get or comicbookdb to stay current. Super excited about the upcoming 50th anniversary X-Men comic this Fall and X-Men Days of Future Past. I am using my fancy pants Kindle Fire to do this blog so hopefully this all works out. It isn’t super easy, I’ll let you know that right now.